Six months (+/- a few) is the standard time needed for an athlete to return to competition following anterior cruciate ligament (ACL) surgery. To reach this date, therapy must be thorough and exact. Range of motion, neuromuscular control, or strength deficits that go unaddressed, negatively influence return to play and can also lead to other long-term consequences. Those who suffer from ACL injuries are at greater risk of developing knee osteoarthritis (OA). Knee OA is a condition whereby the cartilage slowly wears away. This is a painful, life-long health issue that can lead to disability. With proper rehabilitation and adequate strengthening of the quadriceps, OA can be prevented. Sounds simple, but clinicians must also deal with arthrogenic muscle inhibition (AMI). A MI is a neuromuscular dysfunction that limits the ability to strengthen muscle and is common following ACL surgery. With AMI, neurological signals from the quadriceps muscle to the brain and spinal cord are interrupted or slowed. You can read more about Brain and CNS deficits here. So the question is, how do you combat AMI to properly strengthen the quad and subsequently prevent knee OA? The answer might be vibration training. Vibration training employs a low-amplitude, low-frequency mechanical stimulation that exercises musculoskeletal structures. Vibration training provides strength gains without joint loading and stimulates osteoblastic and chondrocyte activity through the mechanisms of mechanobiology. Subsequently, bone and joint health are improved. A recent article by UNC’s EXSS Impact site found that vibration training (local or whole-body) improves quadriceps function by improving central nervous system function. Following vibration training, brain activity was altered in such a way that it became easier for these subjects to activate and use their quadriceps muscles. As such, muscle vibration can be an effective method to improve quadriceps strength and reduce the risk of developing knee OA. Below is the full article from UNC. Why did you do this study? Individuals with anterior cruciate ligament (ACL) injuries are at greater risk of developing osteoarthritis (OA). OA is a considerable burden on the US healthcare system and contributes to physical disability and comorbidities such as obesity and diabetes. The lifetime cost of ACL injury amounts to $7.6 billion annually for patients that undergo reconstruction, $17.7 billion for patients that undergo non-surgical rehabilitation. Quadriceps dysfunction is ubiquitous following ACL injury and reconstruction, and is a major contributor to the development of OA. The quadriceps are responsible for absorbing impact forces during everyday tasks like walking and stair climbing, and also athletic tasks like running and jumping. When the quadriceps fail to act appropriately, their ability to attenuate these forces is reduced, and cartilage within the knee joint experiences greater loading. Subtle increases in joint loading are amplified through repetitive activities like walking, and over time, greater loading contributes to a gradual breakdown of articular cartilage. Given the implication for future OA development, the restoration of proper quadriceps function is extremely important in rehabilitation. However, quadriceps dysfunction is caused by a neuromuscular phenomenon called arthrogenic muscle inhibition (AM), which presents a substantial limitation to muscle strengthening. Essentially, sensory signals from the knee joint inform the central nervous system – the brain and spinal cord – that the ACL as been injured. In response, our central nervous system responds by inhibiting the quadriceps to prevent further damage of the injured joint. While this mechanism may protect the joint in short term, AMI persists for many years following the initial injury and is thought to contribute to excessive cartilage loading and the development of OA. Therefore, strengthening the quadriceps is important in rehabilitation, but traditional exercises do not address AMI. Novel rehabilitation modalities are needed to combat AMI prior to the implementation of strengthening exercises. Previous work in our laboratory indicates that muscle vibration provided directly (local muscle vibration – LMV) and indirectly (whole body vibration – WBV) may improve quadriceps function. However, what remains unclear is the mechanism by which these vibratory stimuli actually work to enhance muscle function. Given that AMI involves alterations in central nervous system function, it is imperative to understand how muscle vibration influences characteristics of spinal cord and brain function. Therefore, the purpose of this study was to understand how both WBV and LMV influence characteristics of central nervous system function. What did you do and what did you find in this study? We recruited subjects with ACL reconstruction for this study. 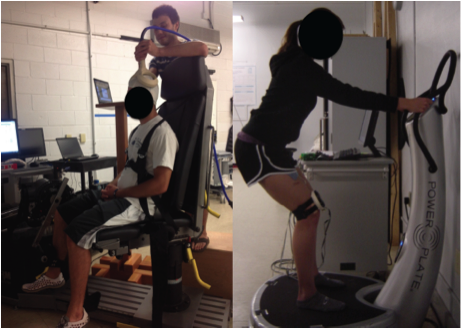 First, we measured various characteristics of quadriceps function (i.e. strength and activation), and also how the brain and spinal cord contribute to muscle contraction. Following baseline measurements, subjects received an intervention of WBV, LMV, or control (no vibration) treatment. We repeated the same measurements of quadriceps function and central nervous system function following the treatment. 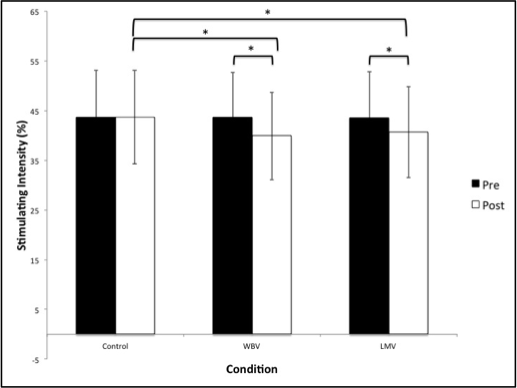 We found that both WBV and LMV acutely improved quadriceps function (strength and activation) relative to the control treatment, and that this improvement was likely due to greater cortical neuron excitability. In other words, muscle contraction can either be voluntary (the brain tells the muscle to contract) or involuntary (spinal reflex loops). What we found was that following WBV and LMV, brain activity was altered in such a way that it became easier for these subjects to activate and use their quadriceps muscles. How do these findings impact the public? These findings indicate that vibratory stimuli acutely improve quadriceps function, and could be useful in addressing deficits in central nervous system function such as AMI. As such, muscle vibration could be an effective method to improve quadriceps strengthening protocols following ACL injury, and in turn reduce the risk of developing knee OA. Overall, knee OA is a major economic burden on the US healthcare system, and these findings could have important relevance for alleviating healthcare costs and physical disability. A comprehensive rehabilitation program is vital for an athlete’s return to competitive sport. Failure to normalize range or motion, strength, and neuromuscular control can result in performance loss, reinjury, or long-term disabilities, such as knee OA. Make sure your rehabilitation program is inclusive of all components. Of course, the best cure for ACL surgery is preventing ACL tears all-together. If you want to prevent ACL injury, read about the RIDS Program designed to prevent injury. This entry was posted in Injury prevention, Knee, Neurological, Rehabilitation, Sports Medicine, Sports Performance and tagged ACL, AMI, Anterior Cruciate Ligament, Arthrogenic muscle inhibition, CNS, knee osteoarthritis, mechanobiology, OA, Power Plate, vibration training on April 13, 2015 by Joshua Stone.